This is a change technique that is part of the NLP submodalities topic. 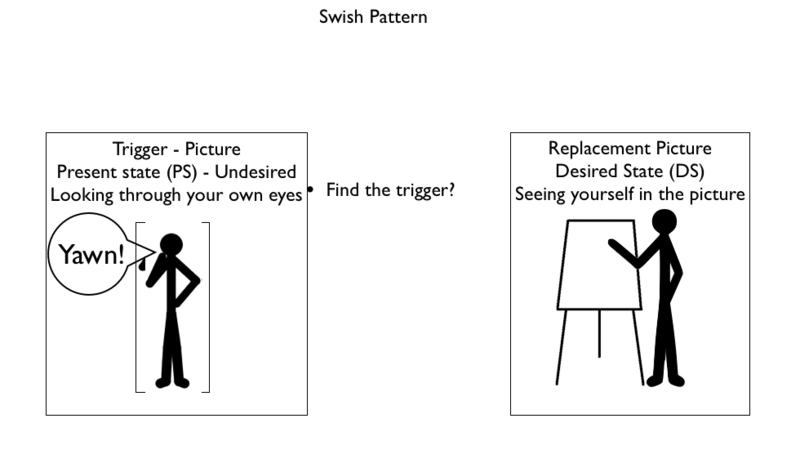 Original and designer swish patterns. It is used for changing a persons state. Elicit the submodalities of the current state and desired state. If the standard swish does not work as the submodalities are specific and strong eg Location. Design the swish specifically to cater for the clients driver submodalities. This is an NLP Master Practitioner technique. Learn how to do a swish pattern intervention with Excellence Assured NLP Practitioner Training Course. You can learn and train at home with our NLP online training packages.